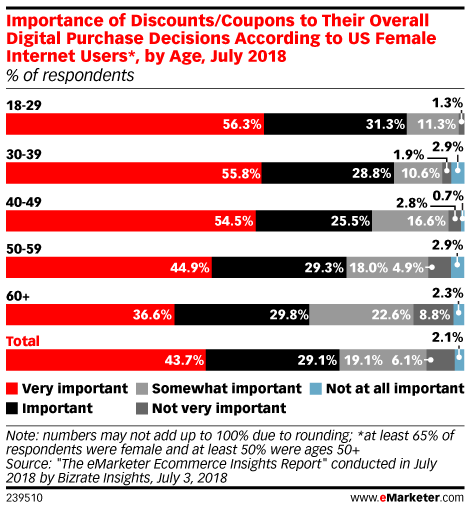 Data is from the July 2018 "The eMarketer Ecommerce Insights Survey" conducted by Bizrate Insights. 1,106 US internet users ages 18+ were surveyed online in July 2018. Respondents were members of Bizrate Rewards, the Bizrate Consumer Panel operated by Bizrate Insights, which is comprised of over 1.9 million panelists who provide feedback based on their experiences and opinions. The Bizrate Rewards panel is comprised of a broad demographic profile which represents a sampling of all genders, ages, incomes and education levels. In exchange for providing feedback, panelists have the opportunity to earn points, which can be exchanged for electronic gift cards. This survey, provided by Bizrate Insights on behalf of eMarketer, provides a monthly consumer pulse of digital shopping behavior and intent.